Want to spend more time in your garden? Are your outdoor plans too often foiled by inclement weather? If so, an Aspire veranda from SunSpaces may be just what you’re looking for. 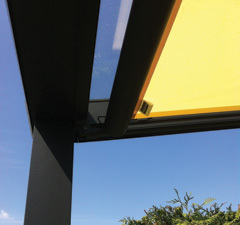 These glass roof verandas are stylish, contemporary, and sturdy enough to withstand any kind of weather. They can be attached to the back or side of your home; we can even supply a detached glass veranda to stand elsewhere in your garden. 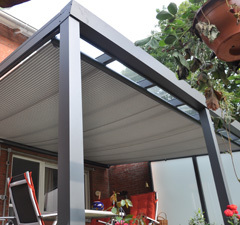 Either way, the end result will be a luxurious, weatherproof canopy that allows you to spend more time outdoors! We want to give you something that will fit perfectly into your outdoor space, and so we offer a wide range of different accessories to complement our glass roof verandas. For example, you can request privacy screens or aluminium walls to keep your neighbours from seeing into your outdoor living space. We can also provide a variety of outdoor flooring options – we think that our Aspire verandas go especially well with TimberTech composite decking (also from Greensquares). Alternatively, you may wish to opt for one of our popular Aspire+ verandas, which has fewer support posts to get in the way of your view. 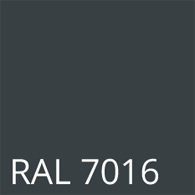 In either case, you can choose from three standard colours (Anthracite Grey, Grey Aluminium or Traffic White) or request a customised RAL colour to ensure that your new veranda will match the rest of your garden’s decor. Whatever you want from your veranda, we at SunSpaces are confident that we can provide it. Email info@sunspaces.co.uk to find out more about what we have to offer, or click here to request a free, no-obligation veranda design and get the ball rolling! 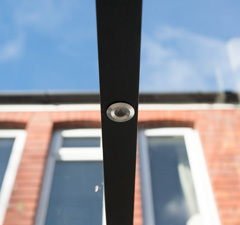 Let our team of specialist installers build your glass roof veranda for you! The Aspire and Aspire+ models feature 8mm thick laminated safety glass as standard. 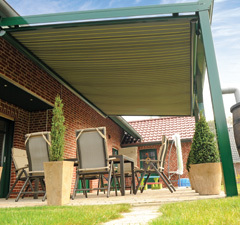 The Aspire veranda comes with a standard gutter cover (see below). 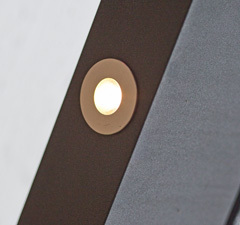 The Aspire+ comes with an enhanced gutter (see leftsee above). We also offer a range of alternative gutter covers. Find out more below. Illuminate your evenings by adding our superb LED lights to your Aspire Veranda. 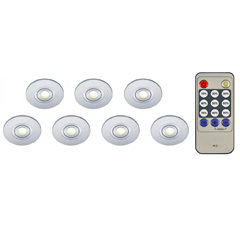 Consisting of 6 LED lights, plus transformer and remote control, these lights will transform your SunSpace at night. We offer a range of heaters (including an innovative heating and sound system – see sound section below). Given the unpredictable nature of British weather these heaters are sure to leave you with a warm glow! 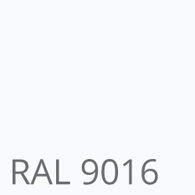 View heating options here. Combat screen glare and reduce internal heat within your SunSpace with our range of fabric shade systems. We offer a manual or an electric shade system complete with UV resistant material. We also offer a manual sunblind. With built in UV resistance, this internal sunblind is available in three colours and in a selection of fabric options (See RightSee Above). Switch from shade to sun quickly and quietly with this fantastic electric sun blind. 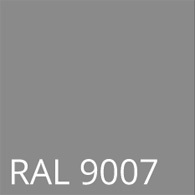 With built in UV resistance to stop fade, these fabric blind are available in a range of colours (See Images Below). A heating and sound system all in one, what more could you want! This system is a heater with an integrated Bluetooth stereo. The golden glow from the lamp really does set the scene and its also dimmable so you can adjust the heat as required. The heater and speakers can be controlled via an app, or via remote control. "We are really thrilled with our new SunSpace veranda. It looks brilliant on the back of the house and makes the whole place look really modern. Plus its massively practical. Allowing us to continue using our outdoor space even when it is raining or slightly cool. Its like having another room ... "